Something old, something older and something brand new for you to win! Many of you will have noticed that I have a bit of an addiction! "No!" I hear you cry, "never!" It's funny how I hear so many voices! Well I'm afraid to admit that it's true - I seem to have a bit of a wood habit. My study looks absolutely gorgeous because every wall is covered in wooden puzzles made by fantastic craftsmen. I have a single shelf devoted to Wil's glass and metal beauties and a half shelf devoted to Traiphum's hand made twisties. I do have quite a lot of mass produced twisties but not on show! Erm - "quite a lot" means 146 unique puzzles! I have been chastised for only writing about expensive puzzles and gently berated by a good friend for ignoring a whole group of puzzles that are absolutely fascinating and, by and large, very affordable. This group tend to be made of plastic and probably broadly fall into the puzzle classification as "Sequential movement" puzzles if one uses the Dalgetty-Hordern system, these can be sub-divided nicely if you use Rob's system - I have taken a screenshot of the relevant section. I had ignored this group for a long time but had gradually noticed that my good friends Michel and Goetz had frequently published about obtaining many new ones in this group and really enjoyed them. Another friend to whom I am most grateful has gifted me with several puzzles from this section over the last 2 years and every single one has proved to be a tremendous challenge and an awful lot of fun. Some have been so difficult that I have so far singularly failed to solve them despite many many hours of effort. The important thing about these is that they are often 30+ years old and consequently only available on Ebay or other auction sites. They also tend to be much cheaper than the newer puzzles and thus great value for money. At the top of the post is a fantastic puzzle that was one of the first that I was given. 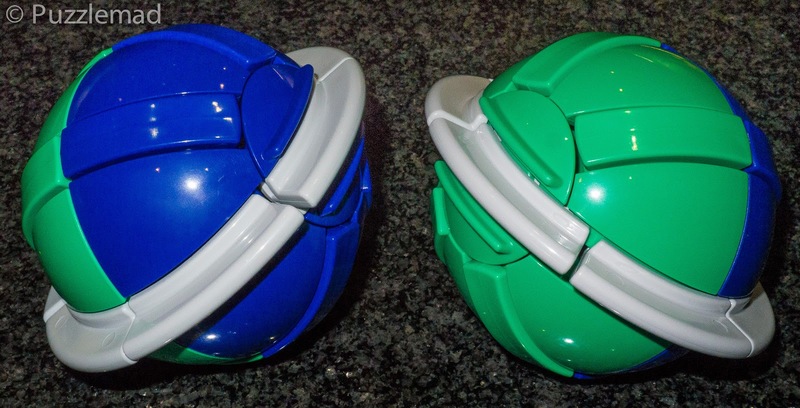 It is The Orb (US name) or Orb-it (UK name) and was first patented in 1981 UK and 1982 US. 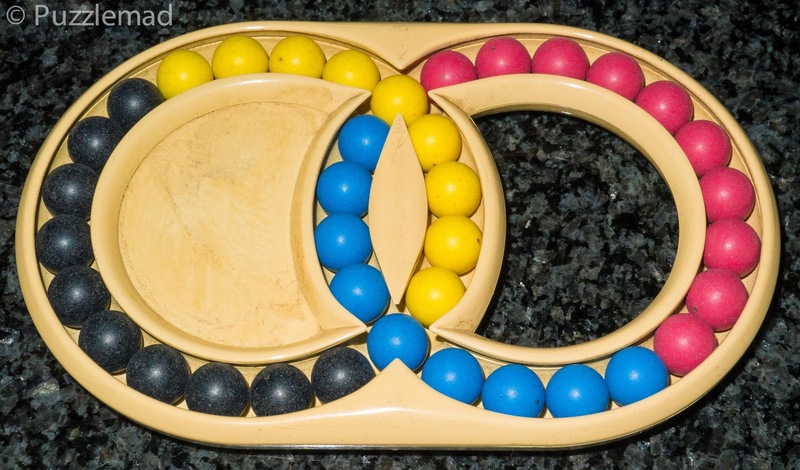 It consists of 4 tracks - those at the poles containing 8 beads and those next to the equator contain 20. 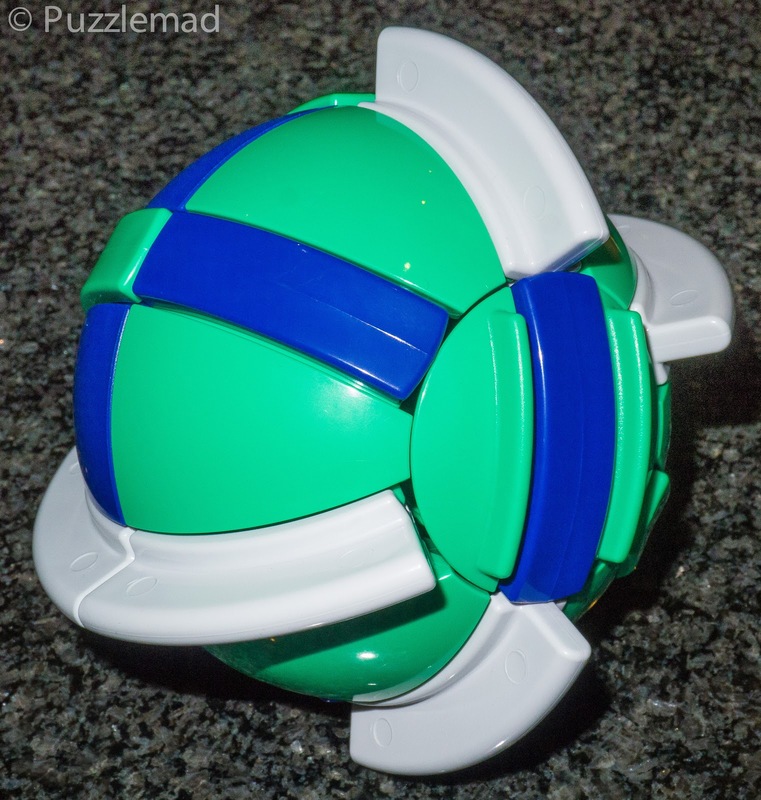 The puzzle is split from pole to pole and can be rotated on itself to move the tracks into different positions - one position creates a single huge spiralling track and another position creates 2 separate tracks rather like the lines on a tennis ball. which seems fairly horrific to me. In terms of solving it - I would think that most puzzlers will work it out within a few hours or days and it is great fun to hand a scrambled one to your non-puzzling friends to watch the bewilderment on their faces. Now if you are a real connoisseur or sucker for punishment then you can buy a special version with more tracks in it from Shapeways. 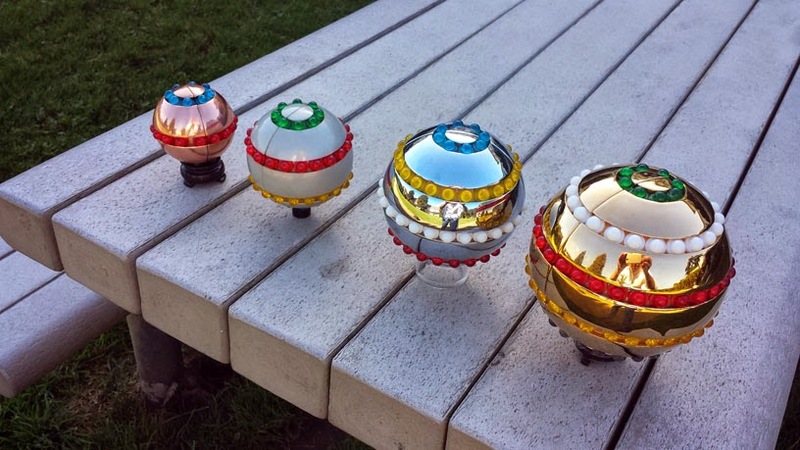 They were designed by Jason Smith aka Puzzle Forge and made truly stunning by having them electroplated! Next up in my list is "something older" - I was intrigued by the Hungarian rings when I saw Oli's review of it here and the even harder Olympic rings version here. 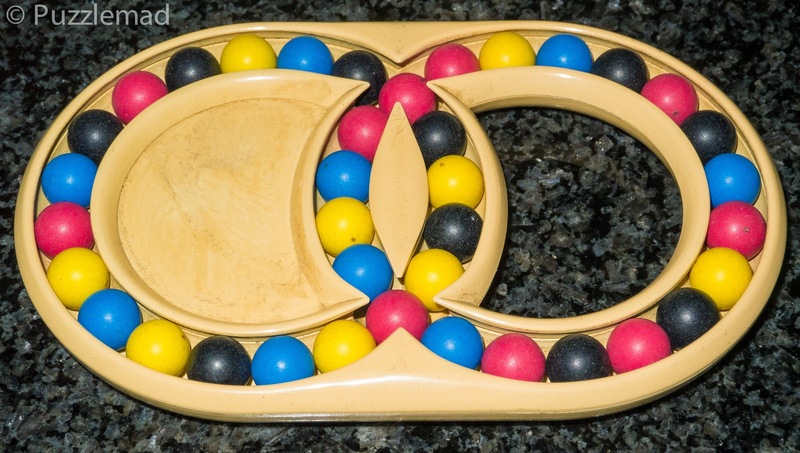 It is a VERY old puzzle dating back to 1893 when the patent was awarded to William Churchill but is still being produced as new even today and is available for just $20 from Puzzle Master or even cheaper on eBay. For this price and with such a history, I would say that these are an almost an essential purchase for any serious puzzler to own. Only marginally less horrific. One thing to be aware of is that there are 8 possible solutions for you to aim for which actually makes this a particularly fun puzzle to play with as you really ought to try and flip between different solutions without scrambling them up. NOW it looks a little harder! This also proved to be a real challenge and took me many many days to work out a system. I can go from scrambled to 2 of the different solutions at will but the other 6 solutions continue to evade me and I certainly cannot flit between them at all. There has been much mathematical analysis of these puzzles which I have found on-line and think that I will need to study in depth. Finally the main event! 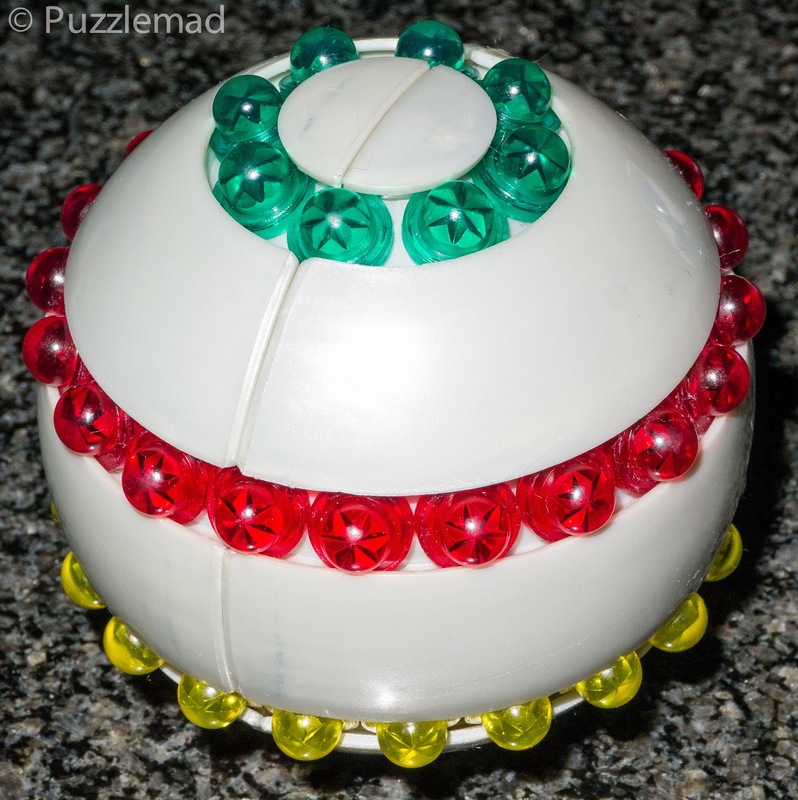 I recently saw an announcement on Facebook that Redman and associates had started to produce a brand new plastic sequential movement type puzzle. I eagerly took a look and realised that they had genuinely come up with something totally unique. Their website is rather sparse just now but I am told that the initial plan is for these to be distributed via Walmart in the US from August and other retailers after that - it should retail at $19.99. It was designed by Clay Judice and is manufactured in Rogers, Arkansas. Initially available in a blue/green/gray colour scheme but other schemes and difficulty levels will be released later. 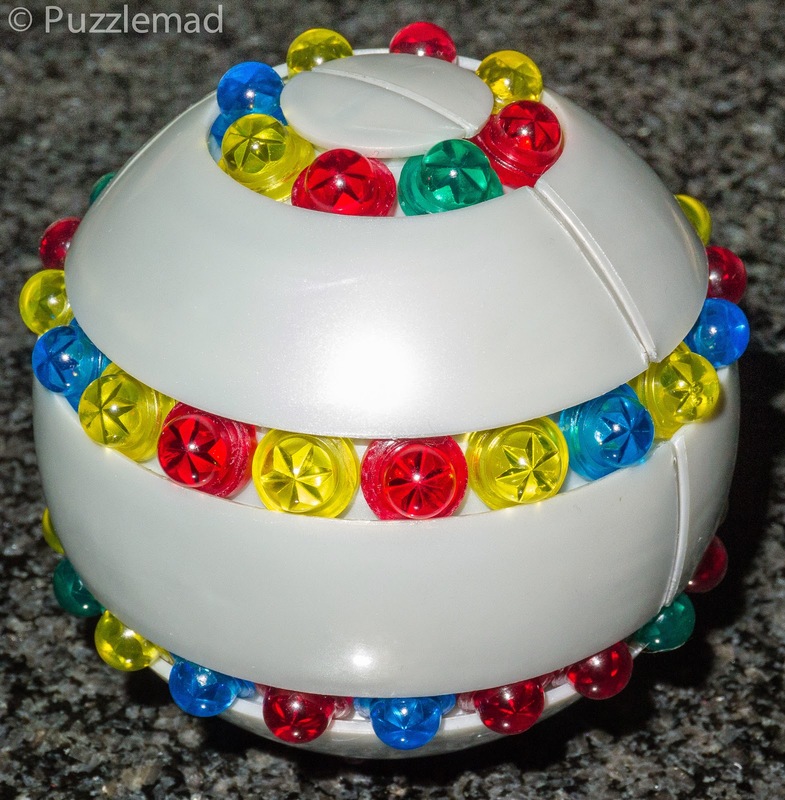 I contacted them asking for information and also dropped a big hint that I had a puzzle blog and was delighted when they offered to send me a copy to try and to produce a review. They agreed to send me two so that I could give one away to one of my readers. The movement did get quite stiff at times and the rotation of the pieces at the poles need to be fairly accurately aligned. This means it is definitely not built for speed solving. I intend to try adding some cubers lube to see if this improves the movement but it certainly is not bad by any means. 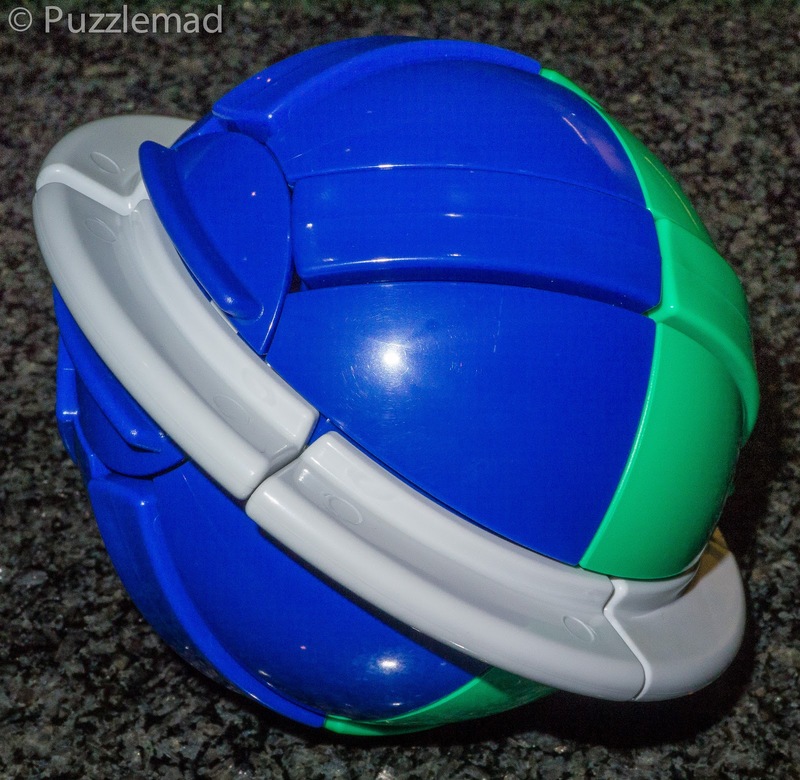 I struggled to solve this for several days and because of the spherical shape, I could not find a way to move pieces into place without ruining those already placed. I'm not a natural at these puzzles by any means. 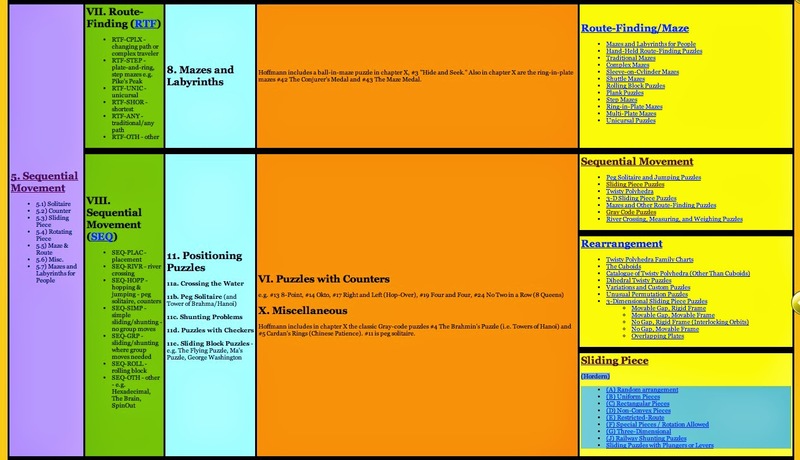 Eventually, I sat down and tried various sequences and made notes on what happened. This allowed me to work out a single algorithm which I was able to use. It's not at all an efficient solution and much is done by intuition but it has let me solve the puzzle 6 or 7 times over the last few days and I have to say it is a nice enjoyable challenge. I would say that for $20 it is well worth acquiring and I really hope that they fulfil their promise and bring out some more with different difficulty levels. But in the meantime - I have one to give away. The company paid for the puzzle and I will pay the postage to anywhere in the world. You don't need to do anything difficult, just leave a comment in the comments section on this post and drop me an email via my Contact page (purely so that I have a way to contact you if you are the winner). I will take all the names (just one entry per person!) from the comments section, put them in alphabetical order in a spreadsheet and use a random number generator to pick one. I will announce the winner in 2 weeks time. Good luck! Of course I will accept it! Would you like to be entered yourself? You're second in the draw James! I'll throw my name in the hat, too! 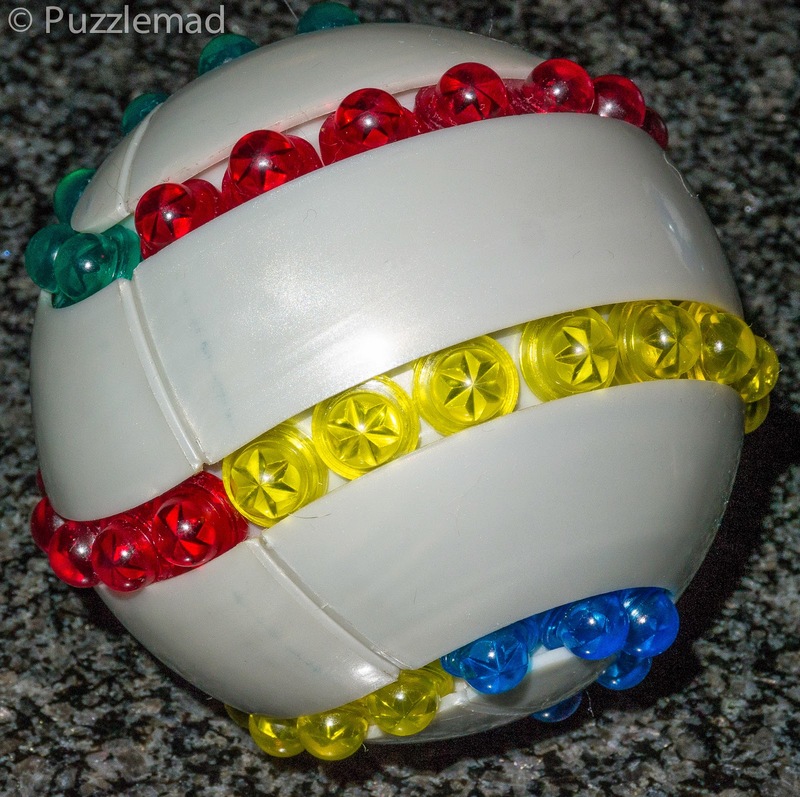 The Buzzle Ball reminds me of the Sphere XYZ, but I can see how it is different, with the rotating "polar caps." Thanks Rob, for keeping such a great resource for us all to use. You are in the hat - only 3 so far! The odds are pretty good! You managed to pull me out from hiding to make a post with this contest. Fun! Interesting post, by the way. These puzzles were all new to me, and seem like they'd be fun! Glad to have enticed you out! You're in the contest! Hi Lucie, I do enjoy perusing your collection for puzzles to add to my own collection! Hi! My name is Elias and I would like to enter the contest! Of course I want to be in this contest! I knew I'd be hearing from you eventually! You're in the draw! Your first formula has a typo, it should be 22! not 220! Currently the value is clearly less than 1 because 220! is much larger than 56!. Checking Jaap's page, it should be a 20! in the denominator. Well spotted! I'll amend ASAP. Buzzle Ball looks interesting, please include me in your magic spreadsheet, too! Thanks Goez, you're in the draw! Thanks for the article Kevin. One note: I don't think the number of positions defines the complexity of a puzzle. A 10x10 sliding-block puzzle is not significantly more difficult than the 14-15 puzzle, but has about 10^158 positions. Of course, you are absolutely correct - the number of achievable positions is not the only factor in deciding how tough a puzzle is. But it does give an interesting idea of it and I love the maths involved! I'm obviously interested in getting this puzzle too. I think it has 14!/(6!*4!*4!) = 210120 positions, without reducing for symmetry, and about half that if you do reduce for symmetry. Hi Jaap, first of all, thanks for your tremendous website! I eagerly wait for new updates from you and read them avidly - it's a fantastic resource! Of course you're in the draw! Well Graham! Scramble it and solve it quick! It's not too hard to do! Hi Rex, You're in the draw. I hope you enjoy the Orb - it's not too tough. Add my name to the pile Kevin. When I contacted the company I got no reply ��. I wondered what happened to you. You're in! I would like to be in the row. You're just in time for entry.